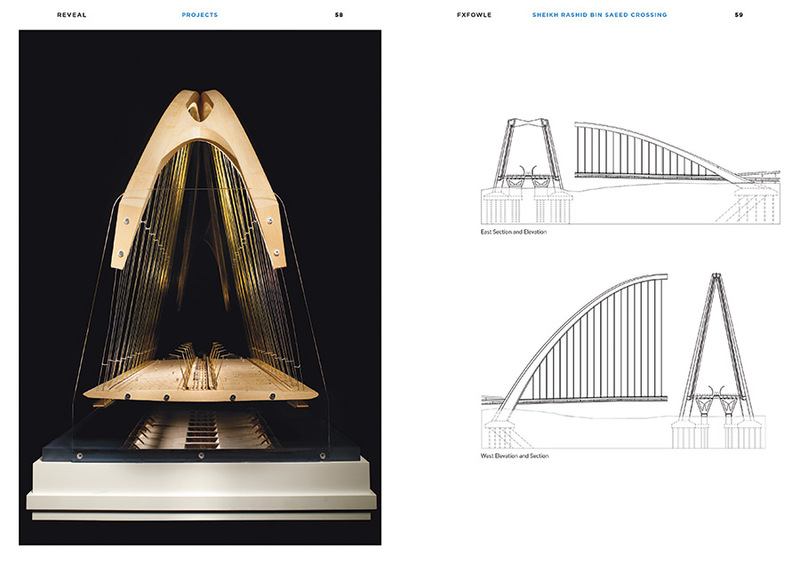 This surprising little book fulfills and enhances the architecture it presents. 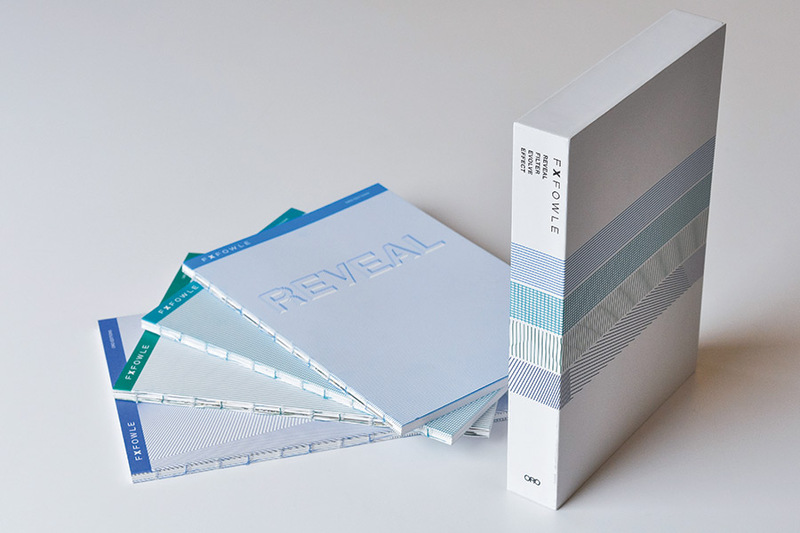 By breaking completely from the traditional monograph format and aesthetic, FXFOWLE has devised an ingenious publication that informs the reader at many levels. The monograph team that planned it did not wish to produce what they scorned as the traditional coffee table book. This consists of lavish photograph portfolios for which projects are described briefly if at all; and even site and floor plans may not appear in page layouts. Such books can be somewhat redeemed thanks to laudatory texts by respected pundits, and tend to be expensively printed and bound, if not heavy to carry. Given that architecture monographs have two essential purposes—the first to market a firm’s talents and skills and the second to document and preserve its history of achievement—more books should teach how architecture really happens. Unfortunately, most do not even try. The four other projects presented in REVEAL are the Center for Global Conservation in the Bronx, New York (2009) that houses the departments for international programs, exhibition and graphic design, and information technology once scattered around the 256-acre zoo campus; the SAP Americas Headquarters Expansion in Newtown Square, Pennsylvania (2008) integrates building and landscape by way of linked building systems that respond to the surrounding woodlands and the remnants of an arboretum; the Sheikh Rashid Bin Saeed Crossing (2011) in Dubai is the winner of an invited international design competition for a bridge intended to alleviate traffic in the city of Dubai; the Qalaalti Hotel Spa (2014) in Azerbaijan relates to its immediate setting, the pleated rock of the Caucasus Mountains. EVOLVE presents five projects that bond with history. The Bronx Zoo’s Lion House Reconstruction in New York City (2008) now functions for animals from Madagascar, the lions long since moved elsewhere; the Richardson Memorial Hall Sustainability Study (2011) for Tulane University in New Orleans, brought about the transformation of a five-story, 67,500 square feet, then 103-year-old masonry structure, to serve a contemporary use but remain intact as a building; the Multimedia Entertainment Company (2012) in New York consists of a modern insertion into an historic fabric; the Jacob K. Javits Convention Center Renovation (2013) in New York retains the character of the original design; the Water Street Redevelopment Vision Plan (2010) proposes physical changes and public programs to extend activity in this downtown New York area. 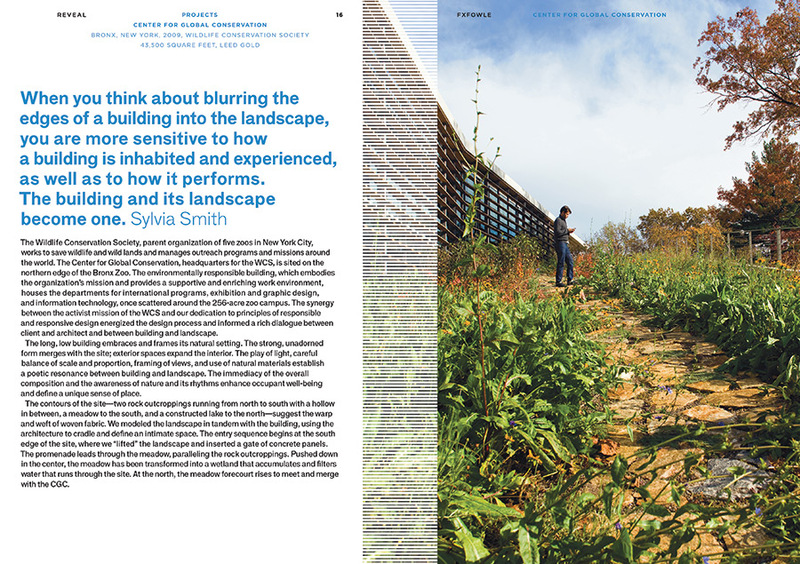 EFFECT, the final booklet, provides an essay on the role of program by Kim Tanzer, dean of the University of Virginia School of Architecture. The five projects presented which focus on this fundamental design process are Hunter’s Point Campus (2013) Queens, New York, shaped by its complex educational purpose as well as its scenic setting; the Rockefeller Brothers Fund Offices (2009) in New York for which the architects began the design for the interior of its new location by rethinking the grant-making process; concepts of daylight directed the design program of Golisano Institute for Sustainability (2013) in Rochester; the Columbia University School of Nursing (2016) in New York required a programming effort that favorably affected the buildings volume, mass, and height; FXFOWLE was able to program a complex building for the Clinical Science Center (2014) in Buffalo that met the requirements for clinical work and research in spite of its highly constrained site. The texts of these four booklets are well supported by the clarity and beauty of the drawings. By hand or computer they reveal the various stages of the design process for each of the nineteen projects chosen, and are handsomely arranged in the page layouts. The power and strength of these drawings have much to teach. 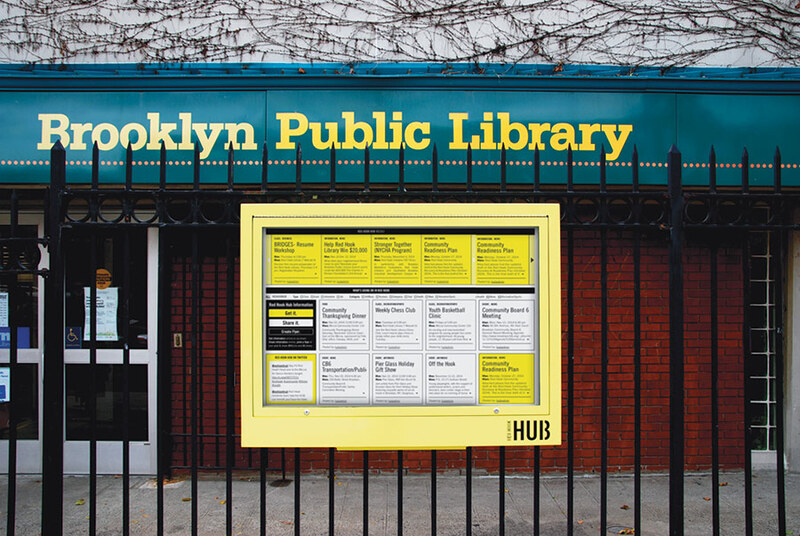 Design/Relief's Red Hook HUB, at the local Brooklyn Public Library branch. Hurricane Sandy in 2012 was one of those extreme conditions that brought residents of affected communities together to think about a different future and a communal way forward. But when communities—particularly poor and underserved ones—attempt to come together for the sake of local identity they often struggle to find a voice for their concerns, let alone communicate with their neighbors. 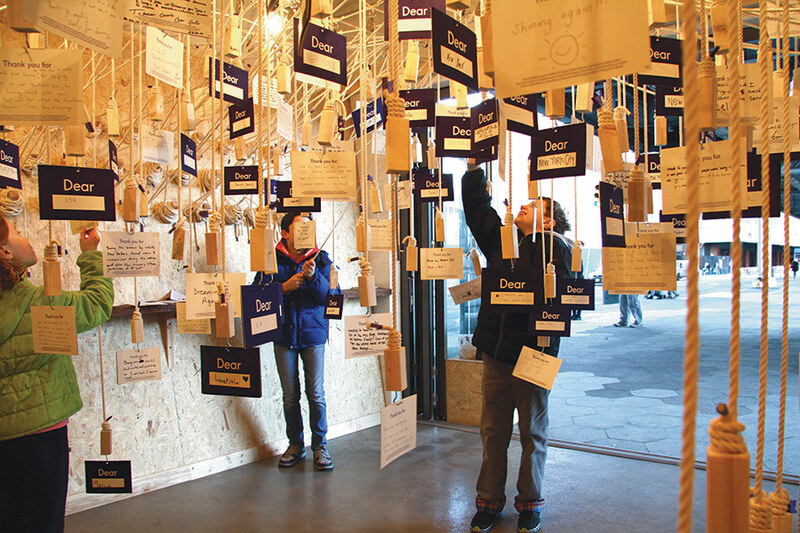 Design/Relief’s Catch—&—Release pop-up installation at the South Street Seaport. It is common for graphic designers to be called into the design process at the end of a project to help create a “branded” identity. But the Making the City program hoped to encourage graphic designers to become part of the bottom-up planning process. AIGA believes its members’ design skills should be used to tackle local challenges in need of local solutions. “Dear Rockaway,” insert in the Rockaway’s newspaper, The Wave. Under a project titled Design/Relief the AIGA-NY helped young designers to engage with local community groups, listen to their complaints and hopes, and then design bespoke initiatives for each of the communities. In the Rockaway peninsula, which has long had diverse ethnic communities of varying wealth and background separated by expanses of sand, they heard the plea to keep the togetherness of purpose that developed just after the hurricane. 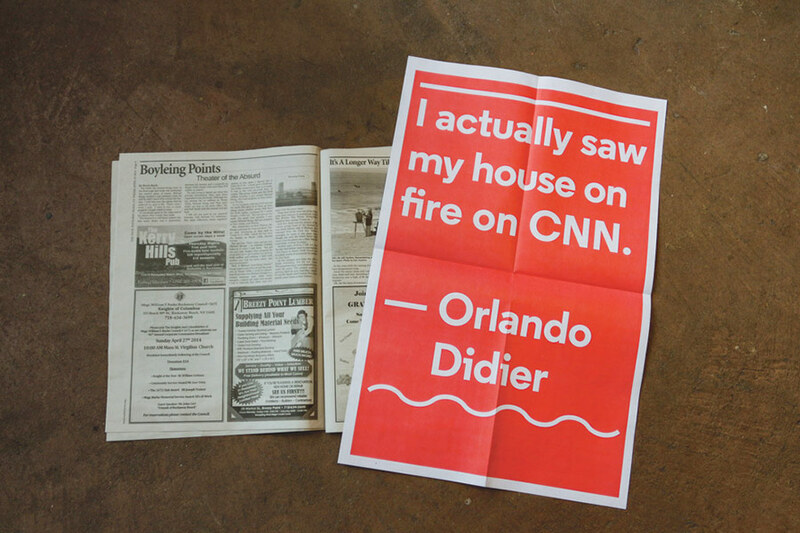 The Dear Rockaway team created bold colorful inserts in The Wave, the Rockaway’s most important local newspaper. These two-color centerfolds appeared with interviews of local residents in a bold graphic style that hoped to create a distinct identity from the bottom-up. In Red Hook, Brooklyn, the AIGA-NY group created a physical “Hub” to act as both a place for analog and digital information gathering in curated and non-curated spaces where residents could come together over community issues. Red Hook, which is isolated from the subway system, is home to the city’s second largest public housing project and new artist and craft communities that surround it at discrete distances along its edges. These communities tend to be separated by race and class, and the Hub, situated in the local library branch on Wolcott Street and the nearby Miccio Center, attempts to help these two groups forge a common community plan. Finally, in Lower Manhattan the AIGA group helped create a public tour that focused on the unheard nearly forgotten voices of residents of the area that have lived there for decades. These three projects all utilized what contemporary graphic design does best—visualize complex information in a simple format and imagine futures. If utilized correctly it also has the capacity to build a “rigorous and engaging participatory processes, and produce easily deployable solutions.” AIGA-NY has begun working in East New York, the city’s latest development focus, to help drive this changing site to consider existing residents while planning to bring in newer groups and architects. The AIA should watch this process and take notes on the project. 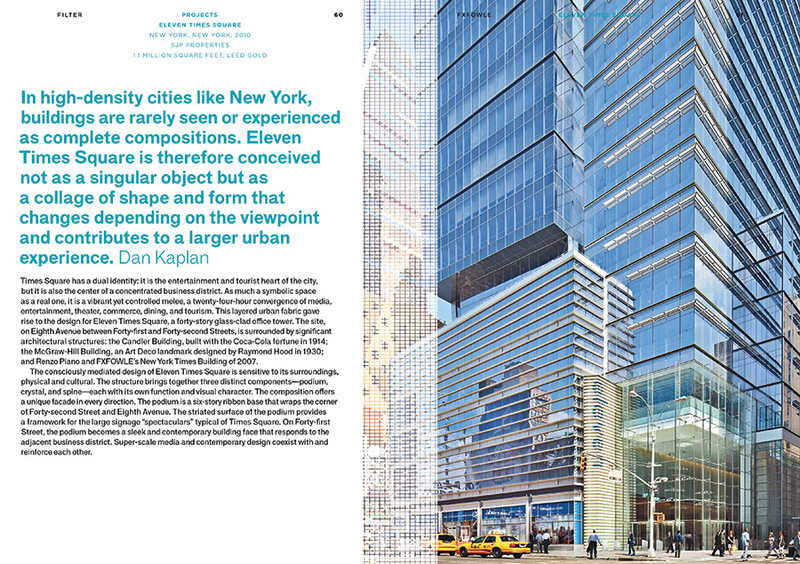 Longtime readers of The Architect’s Newspaper, or anybody who follows architecture and real estate development in New York City, may have experienced an acute case of déjà vu when perusing the cover of this issue. Three of the four front-page stories are about high-profile projects, the designs of which were released to the public years ago only to be put on hold for a variety of reasons that have, to varying extents, now been resolved. 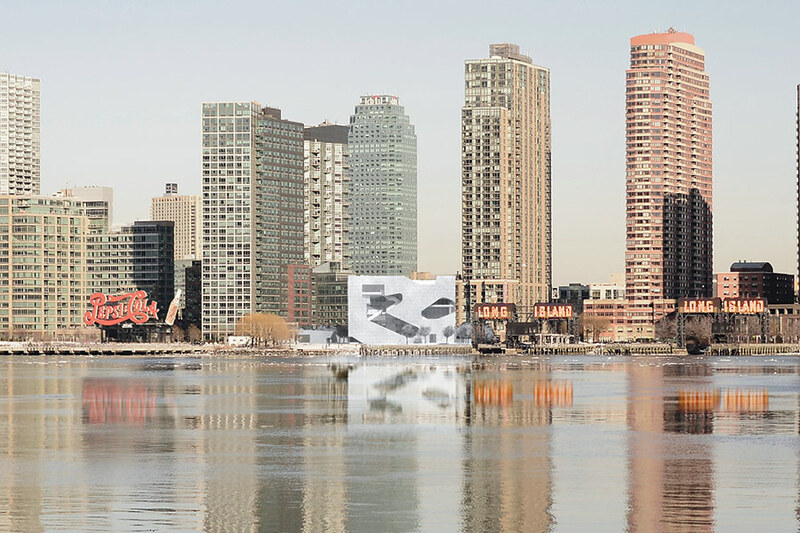 The Steven Holl–designed Queens Library at Hunters Point, which was first unveiled in 2010, broke ground in mid-May. The project originally hit the rocks due to a lack of monetary resources. Even a cost-cutting redesign that swapped the initially proposed aluminum paneled facade for “aluminum painted” concrete, setting the estimated overall price at around $39 million, didn’t bring the building within the budget. In spite of a $7 million shortfall, the Queens Library leadership decided to start construction anyway, figuring that somebody—namely Mayor Bill de Blasio—won’t let the much-needed public amenity (not to mention aesthetic relief from the glass high-rise monotony of the Long Island City waterfront) stall out once the cranes and union labor are busy on site. The Queens Library’s confidence in a deus ex machina ending, with the mayor swooping in to the rescue with a fist full of emergency allocations, isn’t without precedent. De Blasio just peeled off $74 million in city funds, payable over several years, to restart the Fashion Institute of Technology’s SHoP-designed C2 building. The allotment, which matched a 2009 appropriation by New York State, has put SHoP back to work finalizing the designs. We’ll see if the high-tech, vertical circulation–animated facade comes out as advertised in the glistening renderings the architects originally released. By SHoP’s reluctance to re-release those images to AN for this story, however, chances are we’ll see something a little more down to earth, a little more brutal in detail, a little more akin to the state school’s existing facilities. These cash-strapped, publicly funded projects aren’t the only buildings where we’re seeing a dampening of design aspirations. Even in the supposedly no-limit world of super-luxury Manhattan condominiums, boasting Pritzker Prize–winning architects no less, dreams have been blunted. Such is the case with Jean Nouvel’s 53 W 53. First unveiled in 2006, it was brought to heal in 2009 during the depths of the recession by the NYC Planning Commission, which demanded that the tower be shortened 200 feet, from 1,250 to 1,050. As then-planning director Amanda Burden told The New York Times, “The development team had to show us that they were creating something as great or even greater than the Empire State Building and the design they showed us was unresolved.” How quickly things change. A few years after dealing this blow, the commission went on to approve a slew of supertall, super skinny residential towers on 57th Street, whose designs are certainly no more resolved to the standard of the Empire State than Nouvel’s. But that’s what you get for showing up early to the party. In the unbridled thrust of today’s New York City real estate market there are important lessons to be learned from these false starts that made good, more or less. One, you should never say never. The winds of change are ever blowing and even apparently dead dogs can claw their way to new life. Two, if anything, the fondest hopes of designers will suffer the most in these Lazarus-like tales of development—“aluminum painted” for aluminum, a diminished place in the pantheon of the skyline. For the oligarchs and tycoons who buy into 53 W 53 it’s no big deal. At least they won’t be living there. As for the students who will animate C2’s facade and the youngsters who may get their first taste of the effects of explorative architecture in Hunters Point, will they ever know the dreams that became compromises for them to be there? 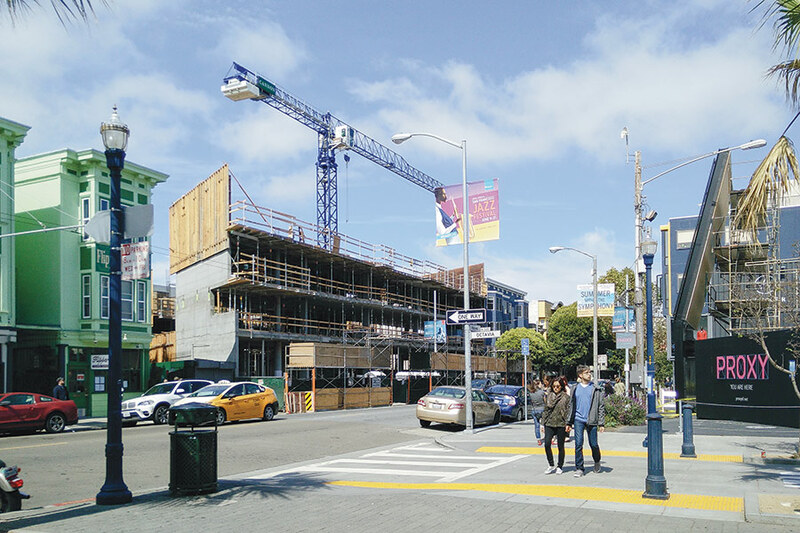 A decade into San Franciscoos Market-Octavia Plan, housing is beginning to take shape. San Francisco is known for removing urban freeways. Most famous is the waterfront Embarcadero Freeway, damaged in the 1989 Loma Prieta earthquake. A few miles up Market Street, however, the 1992 removal of a portion of the earthquake damaged, elevated Central Freeway spurred an even more remarkable transformation. The Central Freeway was a stub that connected several arterial streets and San Francisco’s Civic Center neighborhood to Interstate 80 and Highway 101. 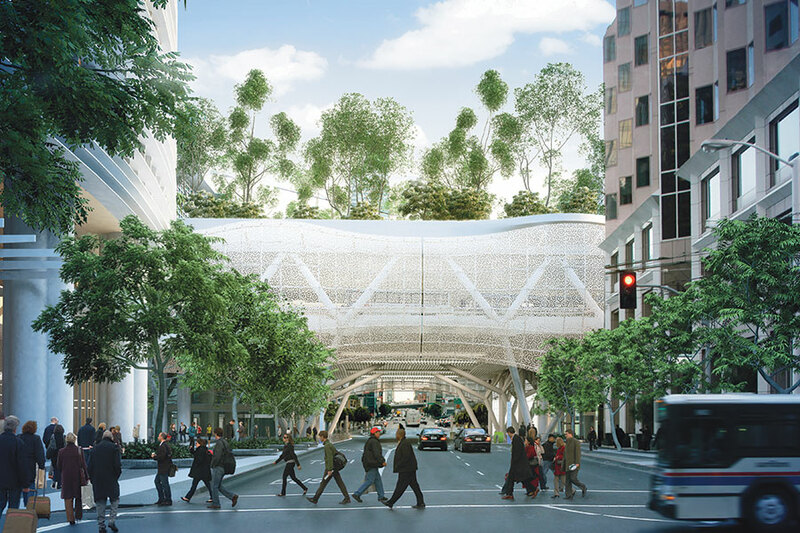 An unsightly overhead structure, it cut through the middle of Hayes Valley, shadowing a dense urban neighborhood not far from San Francisco City Hall. In 2005, the portion of the Central Freeway north of Market Street was replaced with Octavia Boulevard—four lanes of through traffic with planted medians and slower lanes for local traffic and bicycles. In 2007 the San Francisco Planning Department’s Market-Octavia Plan was enacted to preserve existing neighborhood character, ensure increased density in a mixture of housing types, set standards for ground floor uses, and plan for amenities like street improvements and recreational facilities. Patricia’s Green, a small park located where Octavia Boulevard meets the neighborhood’s main commercial strip, Hayes Street, is the center of the neighborhood. Children fill the playground and the green space hosts events such as craft fairs and evening film festivals that would have been unthinkable when a freeway ran overhead. Linden Alley near Octavia Boulevard during a recent street fair (left). 8 Octavia by Stanley Saitowitz at the corner of Octavia Boulevard and Market Street (right). Adjacent to the Green is Proxy, a gathering of temporary modular buildings that house a host of food vendors. It is an interim project developed, designed, and financed by local architecture firm Envelope A+D. 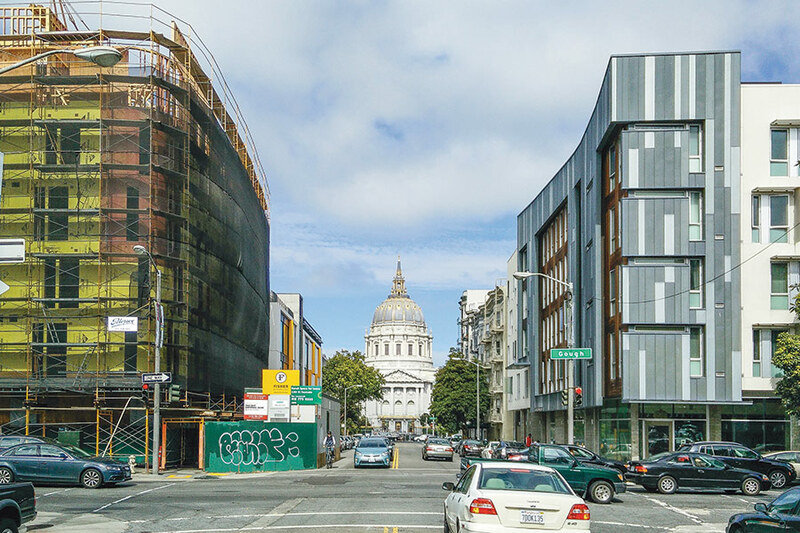 Proxy originally held a three-year lease with the City of San Francisco, but the Board of Supervisors gave it an eight-year extension until the site is developed as affordable housing. 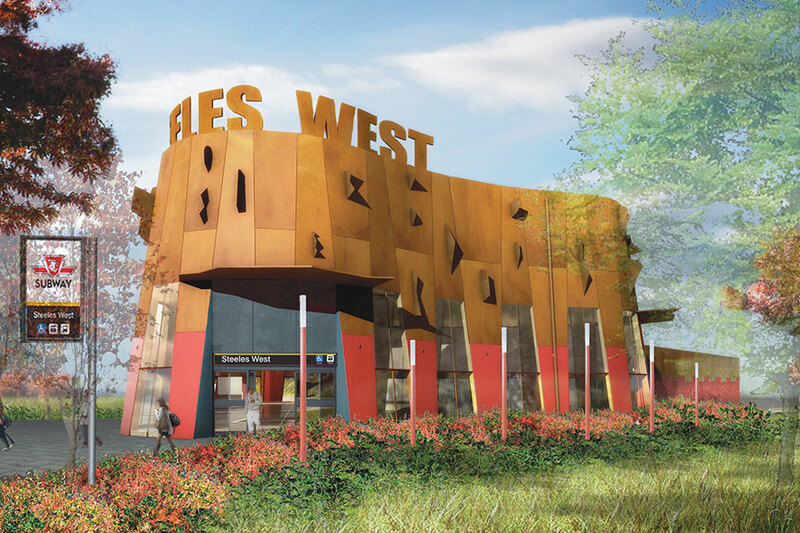 The project includes rotating public programming and temporary facilities that range from a mini golf course to a movie screen, currently under construction. 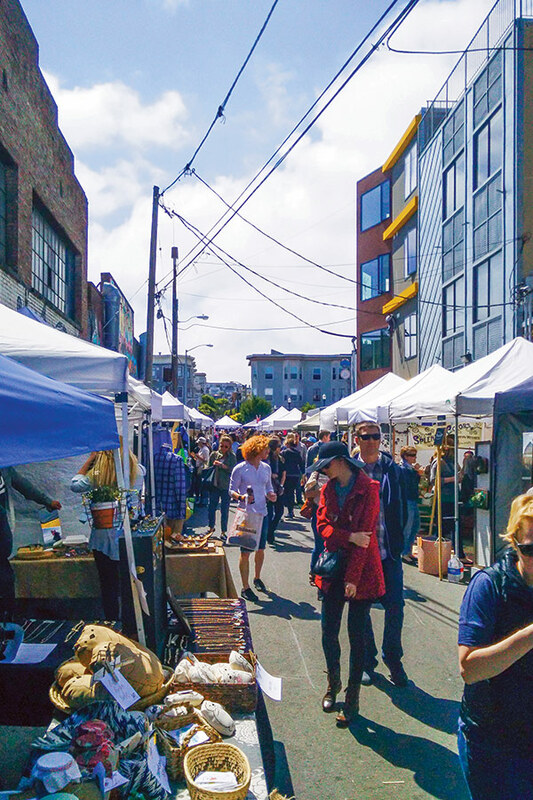 Many other parts of San Francisco have seen contentious battles waged over nearly every new proposed construction project, including a recent fight to enact a housing moratorium in the Mission District. However, the Hayes Valley Neighborhood Association has been supportive of housing development and eager to see good design from some of the Bay Area’s best architects. The neighborhood has been well served by this collaborative attitude from a design perspective. 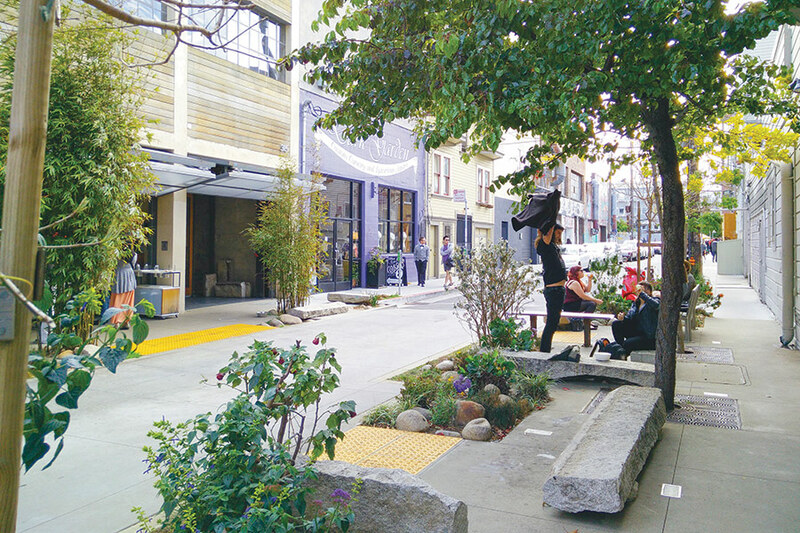 The guidelines set in the neighborhood plan resulted in active ground floors and a lively streetscape. The most recent addition to the neighborhood is Stanley Saitowitz’s concrete and glass 8 Octavia at the intersection of Octavia Boulevard and Market Street. 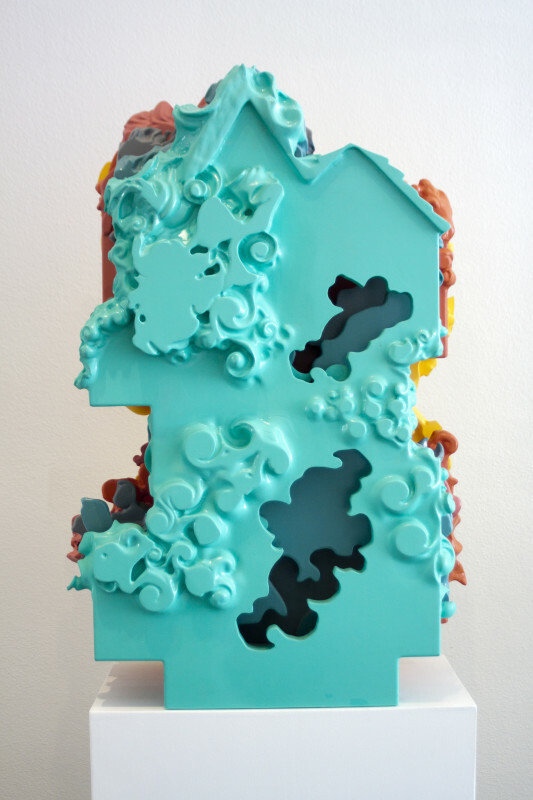 Saitowitz describes the form as responsive to the context by mirroring the cornice line of the Free Baptist Church across the street. The 47-unit, mixed-use building developed by DDG and DM Development opened in 2014 and promptly sold out. 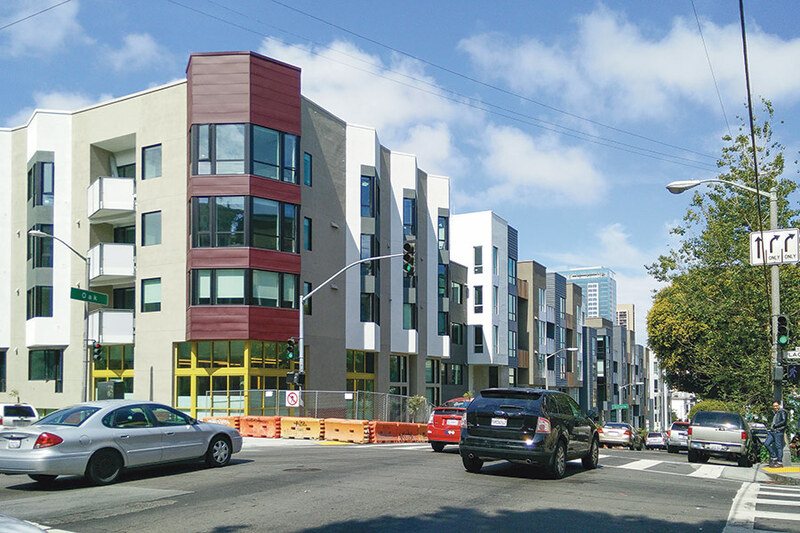 Located on Oak Street between Octavia Boulevard and Laguna Street, a site that was once a freeway ramp is the nearly complete Avalon Hayes Valley. Developed by Avalon Communities and designed by Pyatok Architects with associate architects Owen Kennerly and Jon Worden, the 182-unit, block-long building abuts a new alley on the north. The design picks up on the rhythm of the surrounding neighborhood. Units are advertised starting at $2,910 per month for a 445-square-foot studio (yearly, about half of the median San Franciscan’s annual income). Now, what was once one of San Francisco’s more affordable neighborhoods is one of its priciest. San Francisco has many regulations that attempt to shape the city into what the populace thinks it should be. This includes design guidelines, one- and two-family residential zoning, tough historic preservation rules, and neighborhood notification requirements for planning approvals. Today, Hayes Valley is a very attractive place to live, partly due to this regulatory environment. 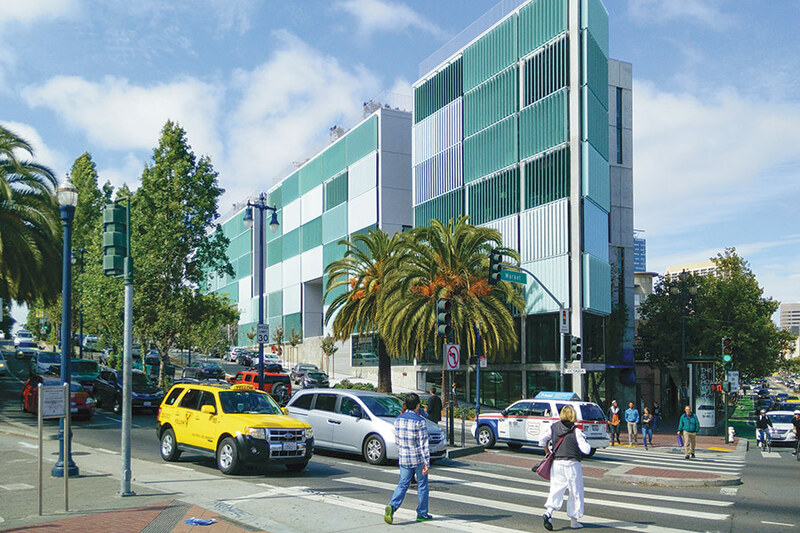 The Avalon Hayes Valley by Pyatok Architects, with associate architects Owen Kennerly and Jon Worden, from the corner of Laguna and Oak (left). 388 Fulton Street under construction across from Richardson Apartments, both by David Baker Architects (right). The flip side of regulations, however, is that San Francisco as a whole has failed to deal with a chronic housing shortage. The issue dates back the 1980s and the beginning of a population rebound in the Bay Area. Some 10,000 people per year—combined with a lag in housing construction—exacerbated demand with this latest boom, leading to skyrocketing rents and sale prices. The working and middle class people who have remained in Hayes Valley and other San Francisco neighborhoods usually owe their presence to strong tenant protections and rent control. In an attempt to address a rapidly increasing cost of living, the Market-Octavia Plan set aside parcels for the development of 100 percent permanently affordable housing. A 16-unit project on Octavia Boulevard developed by West Bay Housing and designed by Ellipsis A+D and Ignition Architecture, Octavia Court was the first to open in 2011. Richardson Apartments, 120 studios for formerly homeless adults developed by Community Housing Partnership and Mercy Housing, followed in 2012. David Baker Architects won an AIA National Housing Award for their design of the project. Yet with the demand for new housing fueled by both a tech boom and a revitalized neighborhood, it is hard for affordable housing to keep up. The city desperately needs a housing strategy that allows more units to be built in larger areas of the city at a lower cost. If the city continues down the path it is on today, San Francisco will be a luxury enclave with little of the diversity that makes it so attractive in the first place. Across the street from Richardson Apartments, condo units at 300 Ivy (developed by Pocket Development and also designed by David Baker) sold for over $1,000-per-square-foot in late 2013, a city record at the time for non high-rise new construction. The ground floor features a high-end restaurant. Sitting over a plate prepared by the James Beard award-winning chef, the San Francisco of elevated freeways already seems a vision of the past. Faceted facade evokes regenerative prairie burns. For most projects, admits VernerJohnson's Jonathan Kharfen, architects steer clear of evoking a potentially destructive force like fire. But Museum at Prairiefire, the American Museum of Natural History (AMNH) outpost in Overland Park, Kansas, proved an exception to the rule. Because Prairiefire houses AMNH's traveling exhibits, its content is constantly changing, and thus provided little guidance in terms of an overarching design concept. Kharfen instead looked to the location. "What is the area about?" he asked. "For me the first thing that came to mind were the prairie burns. Coming from Boston, I'd never seen anything like it." Using dynamic materials including dichroic glass and iridescent stainless steel, VernorJohnson crafted a faceted high performance envelope that embodies the color, movement, and regenerative power of fire. Not long after landing on the fire metaphor, said Kharfen, "I knew of a couple of materials that would be perfect, because for me it's all about movement and light." He began researching dichroic glass, a composite glass that changes colors depending on the angle of view. The museum's sustainability goals—the project is targeting LEED Silver—dictated that the material would double as an insulating unit, the first such application in the United States. But that presented an additional challenge, as products with the dichroic properties embedded in the glass itself would break the budget. To lower costs, the architects collaborated with fabricator Goldray Industries to design an assembly incorporating dichroic film from 3M. The solution turned out to be an aesthetic boon as well as a cost-cutter, as the film itself carries a flame-like pattern. "It's subtly dimply, it's animated, it's beautiful," said Kharfen. 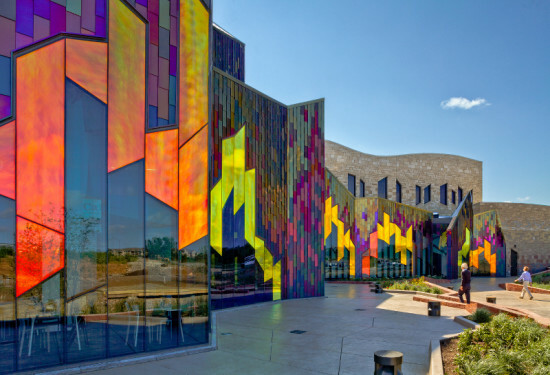 Kharfen's team paired the dichroic glass with a second shape-shifting material, Light Interference Coated (LIC) stainless steel, ultimately applying panels in a variety of color and finish combinations. "With the stainless steel, I wanted to create [the appearance of] flame bursts and sparks," explained Kharfen. "I didn't want to apply it in a random way." Instead, the architects arranged the panels in a gradient, with blue (near the bottom) giving way to burgundies and reds and finally to golden yellow. For Kharfen, it was not enough that the materials themselves convey a sense of life and movement. "I wanted them to be dynamic shapes, dynamic in plan as well as in elevation," he said. His solution—a faceted curtain wall—upped the project's technical ante. To avoid cluttering up the lobby space with columns, Kharfen worked with structural engineers Structural Engineering Associates to design a custom support system of stainless steel tubes fronted by angled mullions, to which the curtain wall is attached as a veneer. To accommodate the 14 unique angles involved in the faceting, curtain wall manufacturer Kawneer developed a new adjustable mullion, a hinged plate with a 180-degree range of movement. Given the museum's ever-changing content, the architects treated the exhibit spaces as "black boxes," said Kharfen. "For the solid areas I wanted to evoke the overlapping, curved forms of the hills." The client, Fred Merrill of Merrill Companies, loved the stonework at VernorJohnson's Flint Hills Discovery Center in Manhattan, Kansas, which suggests striated rock formations. "He asked, 'Can't we just do that here?'" recalled Kharfen. "I said, 'No, we're going to do something different.' I wanted a gradient." To cut costs and simplify installation, the architects whittled a more complex scheme down to a mix of two different stones in each band, with the bands varying in width. Again, the referent is fire: the walls begin with a charcoal-colored architectural cast stone before moving through Kansas limestone in shades of red, brown, gold, and off-white. Together, the stone-clad exhibit halls and the lobby curtain wall complete the picture of a prairie burn. "I wanted the fire elements to engulf and connect the solid volumes," said Kharfen. "I did them as lines of fire, because, historically, that's how these fires were set." But while the burn metaphor extends to every level of detail, including the flicker-flame-inspired sloping at the tops of the doors and windows, for the project architect the museum design ends where it began: with the primary materials. Speaking again of the dichroic glass, he concluded, "I cannot think of a material that looks more like fire than this glass." 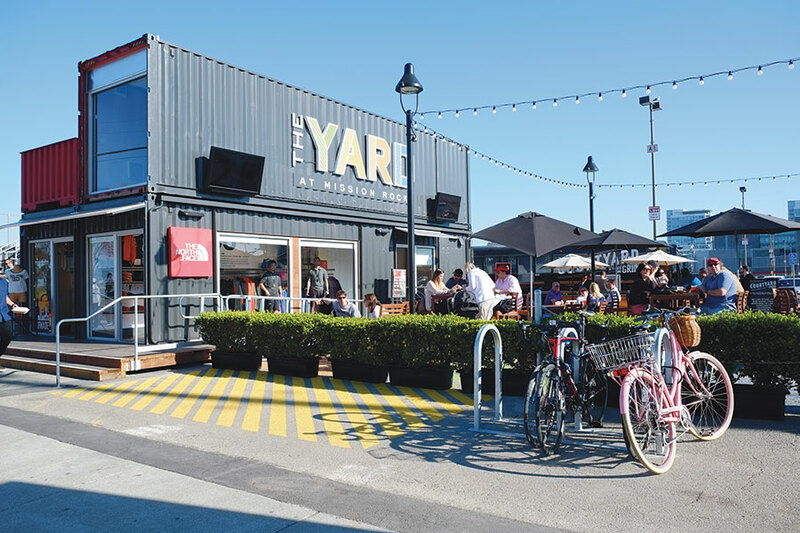 At The Yard, shipping containers filled with retail and restaurants are bordered by outdoor patios and bench seating. More than 90 percent of our goods are transported around the globe in shipping containers. There are over 17 million of these vessels in the world—many easily available for very little money—so it is no wonder architects and designers are looking for ways to repurpose idle units. 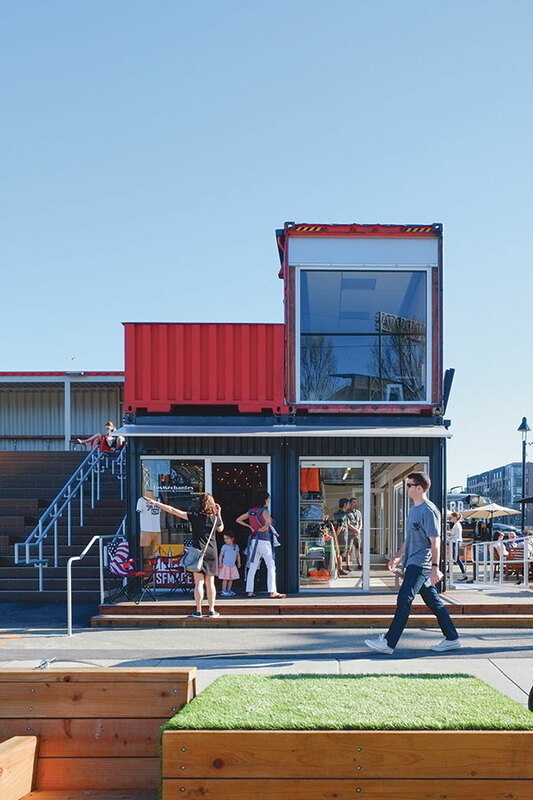 Most recently, the shipping container has found its way to a high-profile project on the San Francisco waterfront, south of AT&T Park, which opened in March. The Yard at Mission Rock, located on an empty parking lot at the corner of 3rd Street and Terry Francois Boulevard, will one day be home to a 1.7 million-square-foot, mixed-used development featuring a 5.5-acre waterfront park, dubbed Mission Rock. But for now, site architects Gehl Studio and OpenScope Studio hope their temporary project will create a village-like atmosphere. 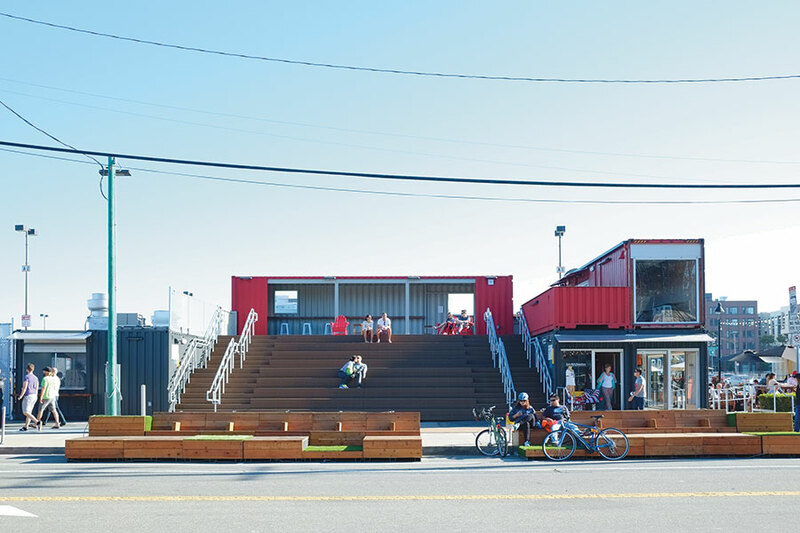 Groupings of stacked shipping containers bring local restaurants, cultural events, and retail to the area. 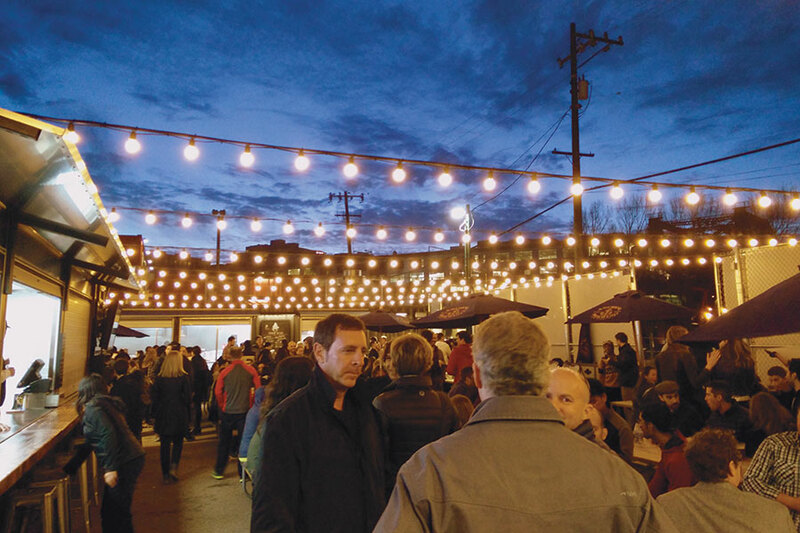 There’s a beer garden, and tenants include The North Face store, SFMade, and Off the Grid. There are also spaces for relaxing, lounging, and socializing woven throughout, with plantings, chairs, and steps that can be used as seats and patios. Transport Products Unlimited and American Transportation Services provided the 13 modified shipping containers, with the San Leandro–based company UrbanBloc designing and building the interiors. While the designers and the San Francisco Giants see The Yard as a space for people to meet during game time, they also hope it will attract people for community events such as concerts, yoga, cooking demos, a farmer’s market, happy hours, and, of course, for the food. The Giants funded the $2.5 million cost of the project, and are renting the site from the Port of San Francisco. The Yard is expected to stay up for two to three years, until Mission Rock construction starts. The shipping containers may be moved elsewhere. 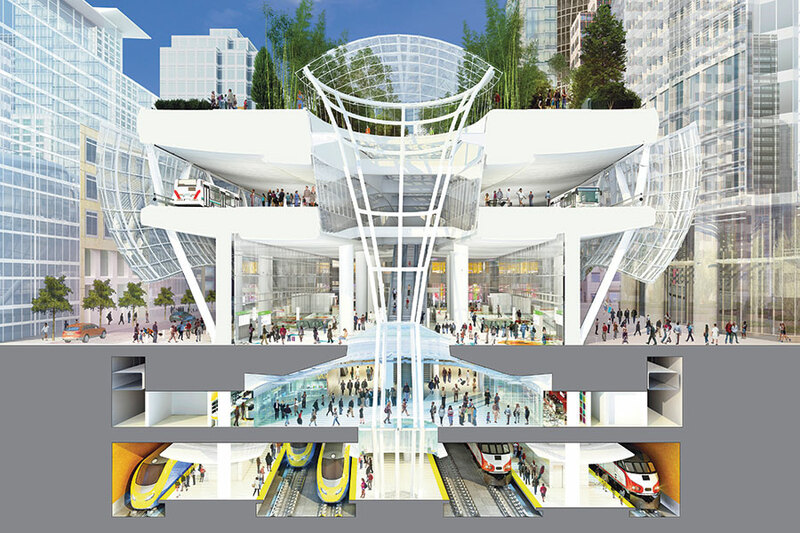 Pelli Clarke Pelli’s $1.89 billion Transbay Center in San Francisco, set to open in 2017, promises to catalyze the redevelopment of its downtown neighborhood, centralize the Bay Area’s vast transportation network, and serve more than 100,000 rail, subway, and bus passengers a day. San Francisco–based Auerbach Glasow French (AGF) designed the lighting scheme for the four-block-long project. The goal was to accentuate the architecture and make the glassy structure glow from within. “The building wants to feel like it’s filled with light,” said AGF principal Larry French. Achieving this effect came with its challenges. One, the project is aiming to be one of the most energy efficient transit structures in the country, so daylighting had to be a large component of the design. Two, towers surround the site, casting long shadows. In answer, the design team developed an inventive method to pull in as much natural light as possible while using the most efficient fixtures available. 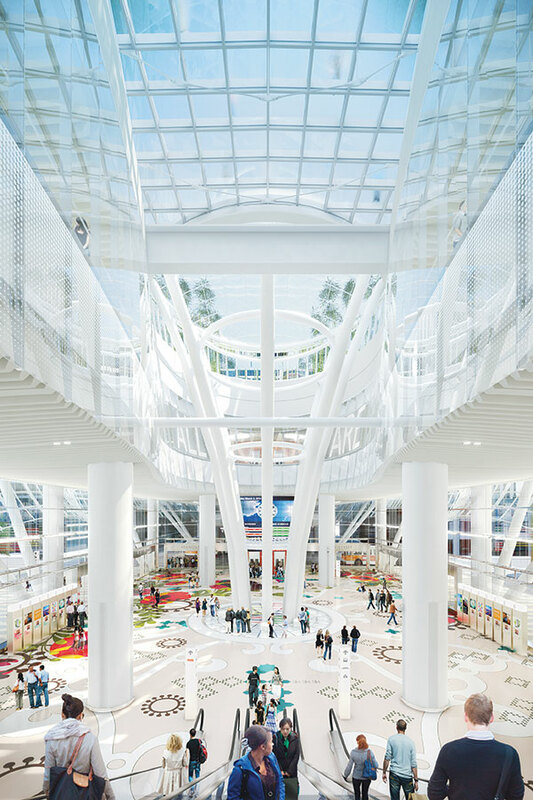 The centerpiece of the 1.5 million-square-foot, five-level project is the Light Column, a massive steel structure that pierces the building’s multi-story Great Hall. The column is uplit and downlit by powerful fluorescent spotlights mounted on its frame. Similar lighting is attached to the building’s exterior columns and beams. Thus far LEDs are not powerful enough to fill the hall’s vast volume, said French, but that may change as technology advances, so the fluorescents may be switched for LEDs before construction starts. “Trying to keep the technology current is very difficult because of the very long lead times,” said French. The team began working on Transbay eight years ago, and the first construction documents were completed four years ago. Most of the building’s vertical surfaces are washed with LED fixtures, emphasizing their planes and bouncing light out of the building. LEDs also line the railings of the escalators and stairs, and are present in gaps between areas with lower ceilings, such as in the bus deck below the rooftop park. French chose moderation over excess when it came to distributing the fixtures. “We tried not to have too much going on. A building can get busy very quickly,” he said. During the day, the artificial light supplements the natural illumination enabled by the design. Glass curtain walls on all four sides of the building are covered with perforated metal “awnings” that allow dappled light to filter inside in geometric patterns. Natural light flows in from above through three elliptical skylights, with ceramic fritting to limit heat and maximize privacy. The two smaller skylights measure about 65 feet by 40 feet, while the largest, hovering over the Light Column, measures 85 feet by 65 feet. Daylight also enters through a translucent and multi-layered 150-foot-long glass floor, which is part of the center’s 5.4-acre rooftop park. The Great Hall has its own glass floor that admits light into the center’s lower levels. It is a similar system to the rooftop, but measures about 40 feet in diameter. Sunlight is balanced during the day with strategically placed fixtures, which were calibrated through extensive lighting studies. “You don’t want to bring in too much natural light and have dark contrast areas,” explained Heather Kim, a senior associate at Pelli Clarke Pelli. The combination of natural and artificial light is punctuated by “Parallel Luminous Fields,” a light sculpture designed by James Carpenter for Shaw Alley, a covered pedestrian passage leading to the center’s main entrance. The piece consists of 54 illuminated pairs of cast acrylic resin glass pavers set into the wave pattern of the ceiling and illuminated benches set into the pre-cast concrete floor. These two planes of light will create a sense of movement leading people into the center. This varied combination of light sources is meant to aid with wayfinding and make users feel as comfortable as possible. But it doesn’t hurt that it adds a little “magic,” as French put it. “It’s exciting. The building is really going to be quite striking,” he said. Sam Lubell is AN’s West Editor. 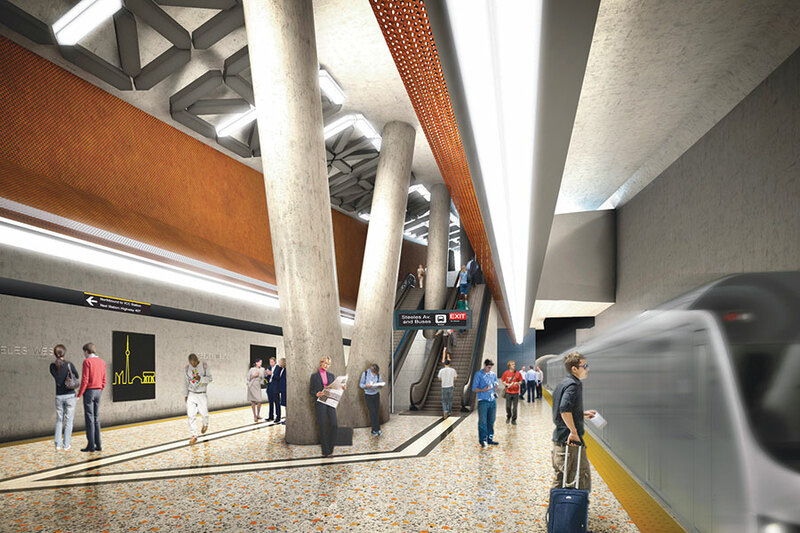 When The Toronto Transit Commission (TTC) opens six new stations along its Toronto York-Spadina Subway Extension, subway riders in Canada’s biggest city will not only be connected to an extra 5.3 miles of track. Thanks to an installation that doubles as platform lighting and a work of art, riders at the Pioneer Village Station will also gain a glimpse into the personalities of their fellow train riders. Working from 3D models developed by station designers Alsop Architects and SGA/IBI Group Architects, Berlin-based Realities United created a station-specific art installation that allows visitors to broadcast a written message on an LED scroll displayed above the train platform. Dubbed LightSpell, the piece is composed of 40 LED chandeliers, organized into a row of 16-segments capable of displaying letters, numbers, and special characters. The station’s centerpiece is an art installation called LightSpell designed with Berlin-based Realities United. It comprises 40 LED chandeliers in a row of 16 segments that display uncensored messages typed by riders on a public keyboard. “It is a democratic installation: Any wording—however rude, stupid, offensive—will inevitably also be the light source serving the demands of the community of other waiting people,” continues the project description. “We do believe that the interest to use the system in a stupid way will diminish once the students notice that there is NO censorship and hope that it will rather be used creatively,” Edler told AN by email. The station sits at the intersection of Steeles Avenue and Northwest Gate on the edge of York University’s campus. Lighting is an integral part of the station’s design. “It’s a true hybrid between an art installation and function,” said Bruce Han, an architect with IBI Group. 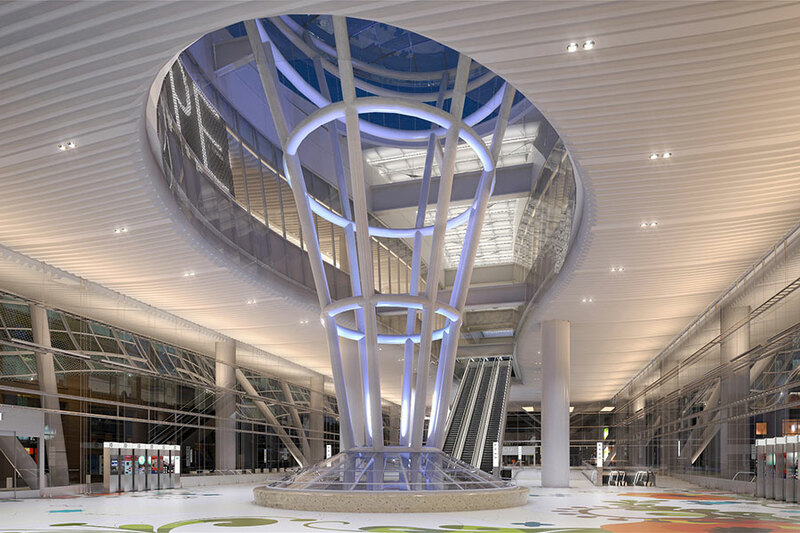 While the illuminated messages of LightSpell comprise the bulk of the lighting along the subterranean platform, a conical opening in the roof at the platform’s center conveys natural light from above. Elsewhere in the station, the design team worked to include natural light wherever possible. Large triangular windows rise from ground level in the station entrance, filling the circular space with daylight. Metal poles topped with fluorescent fixtures lead visitors into the station, whose jellybean-shaped volume connotes playfulness, said Han. When completed in fall 2016, the Spadina extension will be the first TTC rail line to span the city limits of Toronto. Pioneer Village Station includes a 1,900-space parking lot as an accommodation to suburban commuters in the adjacent city of Vaughan. “We wanted to create a new public focal point that would encourage future development as well,” said Han. A swooping, cantilevered canopy shelters a regional bus terminal for York Regional Transit. Together with the train station entrance, the transit hub’s entrances serve as sculptural focal points, bisecting the parking lot. Taking inspiration from rock-climbing walls, the architects wrapped the weathering steel-clad building with triangular planes and knobby shapes. Inside, above the escalator and stairs leading down to the platform, IBI added a light installation of its own: a cylindrical volume of perforated steel that transmits the glow of tubular LEDs inside through a peppering of small holes at its base. Pioneer Village Station is not the only station along the York-Spadina extension that has been designed with an integrated art installation. TTC hired artists to enliven all six new terminals along the route, using funds from the “one percent” program it bakes into public construction costs. Whatever opinions subway riders have about the program or the new station’s design surely will not go unheard—just keep an eye on the LightSpell scroll once it is up and running. 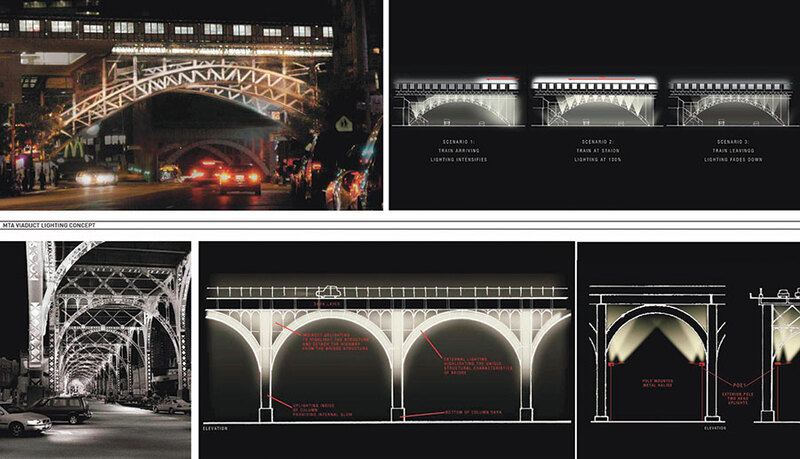 These renderings depict the concept proposal to light the IRT crossing (top) and the 12th Avenue Viaduct (above). West 125th Street in Manhattan between Broadway and the Hudson River has long been a no-man’s land of broken sidewalks and shuttered storefronts, a scar of urban blight in a neighborhood full of them. But it won’t be for much longer. 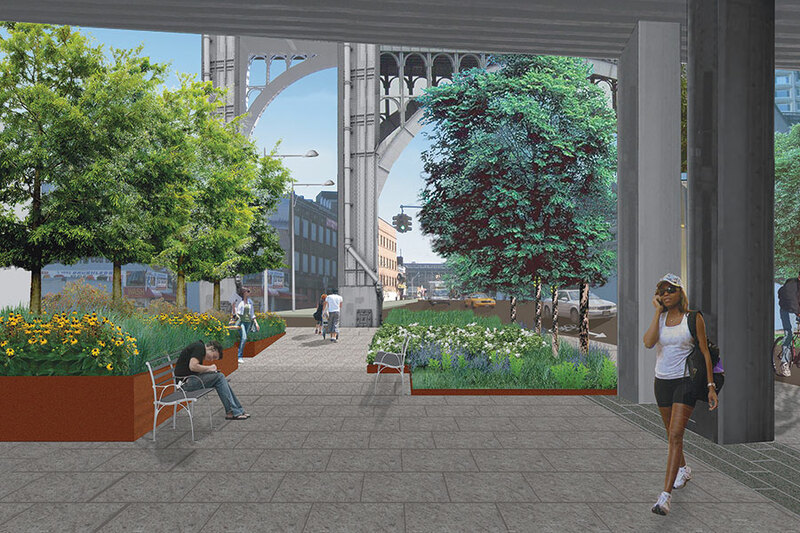 In 2004, the New York City Economic Development Corporation hired New York City–based landscape architecture firm Mathews Nielsen to redesign the corridor as part of its West Harlem Master Plan. The $14.5 million street enhancement project was developed to improve access to the revitalized West Harlem Piers Park, which runs along the Hudson River between St. Claire Place and West 135th Street, while at the same time preparing the ground for the future development of Columbia University’s Manhattanville campus expansion. In March 2014, a decade after the design was commissioned, construction got started. By the end of 2016, this one-time blasted heath should be ready for the safe passage of college students and condo-dwelling urban professionals. Mathews Nielsen’s design includes pavers and plantings to make the corridor a more pleasant place to be. Mathews Nielsen’s design works within the guidelines of New York’s Complete Streets initiative to make the thoroughfare accommodating to people on-foot, cycling, and driving. Signaled crossings and pedestrian refuges aim to make the corridor safer for all, while trees and other plantings soften the urban environment’s hard edge. At the west end of 125th Street there is an intermodal plaza with a bus turnaround and a link to a ferry landing in the Hudson. The design team mocked up the lighting scheme on the IRT station to test its effectiveness and to make sure glare did not interfere with the operation of the subway or cause light polution that might bother the neighbors. The blue light combines well with the yellow street light and is a saturated color that works well with LED technology. To accentuate this sequence at night, these structures are being illuminated with lighting schemes designed by New York City–based L’Observatoire International. The lighting approach was different for each structure due to their distinct formal qualities as well as the peculiarities of the agencies that maintain them. The MTA, for example, would not allow the design team to attach light fixtures to the IRT structure, so the fixtures are being mounted on U-shaped poles that thread through the subway platform’s arch. NYCDOT, which maintains the 12th Avenue Viaduct, had no issues with the attachment of light fixtures. Here the designers are nestling the fixtures in the hips of the arches, where they uplight the cathedral-like spans. While both structures are lit with white light, here again there is a variation. 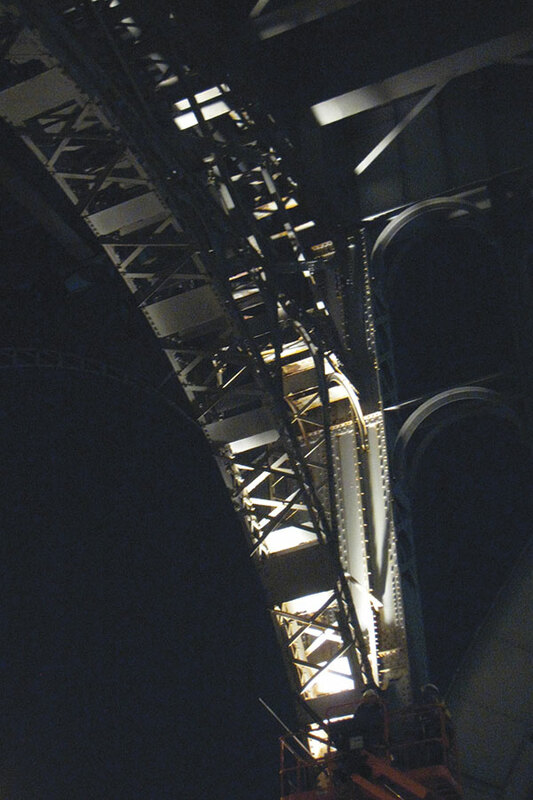 The designers chose warm, 3000K white light for the MTA bridge, which is painted beige, produced by four 315W metal halide fixtures with narrow four-degree beam spreads to cut down on glare and light pollution. The subway crossing also features blue light that comes on when a train is approaching the station, produced by eight 28W LED fixtures with six-degree beam spreads. 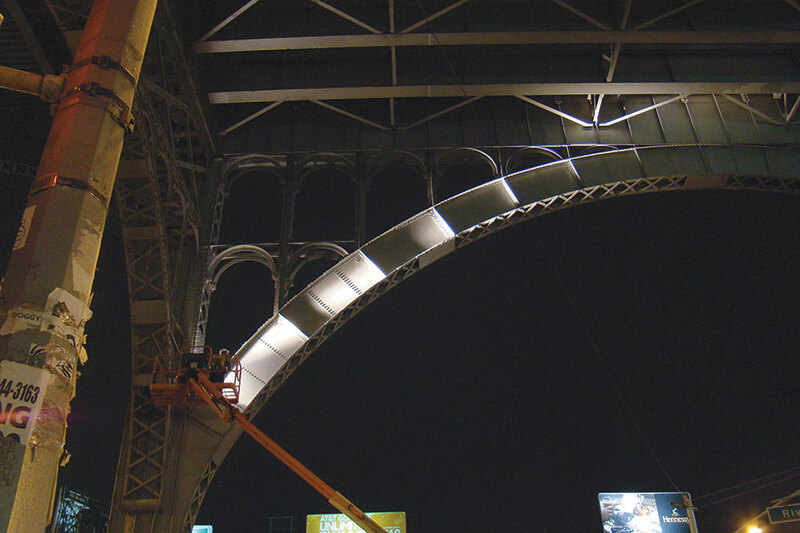 The team chose cooler 4000K white light for the viaduct, which is painted gray, produced by eight 150W metal halide fixtures. Under the current project scope, the lighting scheme will only be applied where the viaduct crosses 125th Street, but it is modular and could be rolled out along the entire length of the bridge, a proposal that the design team has put forth to the local business improvement district, in case it feels like funding it. Aaron Seward is AN’s Executive Editor. 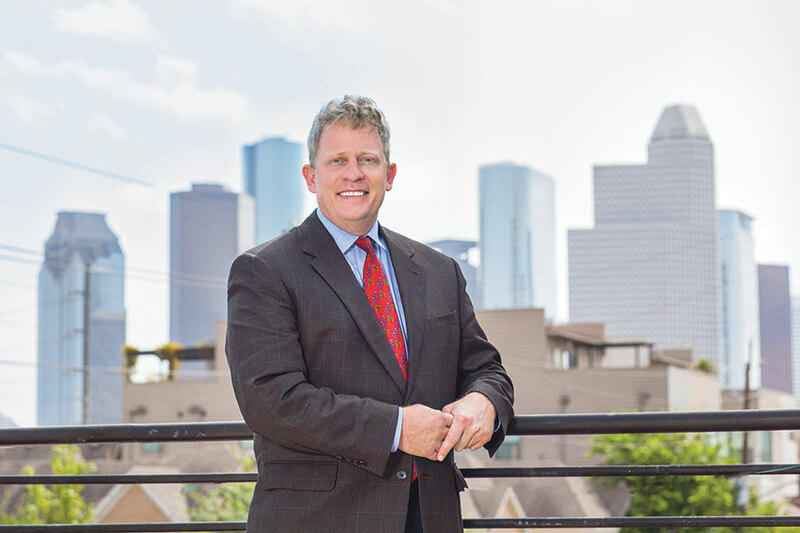 David Robinson is an architect and an at-large Councilman for the City of Houston. Throughout his career he has been involved in neighborhood issues. He spent eight years as an officer and two-time president of the Neartown (Montrose) Association, and was elected to serve as chairman and president of the citywide Super Neighborhood Alliance, a term that concluded in January 2013. Mayor Bill White appointed Robinson to the City of Houston Planning Commission in 2007 while he was serving on the board of directors of the Houston chapter of the AIA. Mayor Annise Parker re-appointed him to the post in 2009. He was the first licensed architect to serve the city as a commissioner since the 1970s. Florence Tang recently sat down with Robinson to talk about his background, the future of Houston under the General Plan currently under review, and the role of an architect in public office. Florence Tang: Where did you grow up and how do you think that has shaped how you view and work in Houston? David Robinson: I was born in Massachusetts in the town Northampton. My father was a political science professor at Smith College. I grew up in Boston and my mom went to Harvard where she got her doctorate. I spent two years of high school at Concord Academy outside of Boston. It was idyllic and had a strong arts program where I got into photography and where I started my artistic venture. I went to Yale on a portfolio of photos and I wrote an essay about Ansel Adams. I got there and took a lot of art and majored in architecture. Then I applied to Rice and came to Houston in 1989. I have some family in Houston and that has been a wonderful draw for me. My mom was born in Dallas, so on vacations we would come to Texas and Houston. As a child, I saw the nice, warm side of Texas, where it seemed like it was palm trees, swimming pools, and beautiful buildings. I was leaving New England’s frozen parts and coming to Texas. Because of that, I always kept a warm spot for Texas. I studied the classics and art history at Yale and when we studied the architectural monuments of Texas and the criticism—the sprawl and ugliness—I was left with a jarring feeling because that was not my impression. As an at-large councilman and vice chair of the quality of life committee, the past couple of years, what major issues have you seen come to the surface from both the city and citizens groups that have been on the forefront of the conversations in Houston? I am getting used to life on City Council. I have a wonderful office staff at City Hall I am very proud of. The team is incredible. If there is any point to emphasize, we are trying to do the work we have been asked to do. I was appointed as the vice chair of Quality of Life Committee. And I am the only freshman CM to be appointed to a committee. This committee includes four city departments: Parks and Recreation, Health and Human Services, Library, and Planning and Development. We also have oversight over cultural and international affairs, like the Houston Arts Alliance and all the embassies. The other day I met with the Emir of Qatar. I also got appointed to the Houston First Board in an ex-officio capacity. These are the city facilities dedicated to the arts like George R. Brown Convention Center, Hilton Americas Hotel, the Wortham Center, and Jones Hall. I try to advocate for good design and high quality of life. I hope to be the right advocate for the profession. On the political spectrum, I am progressive. My success is to stay in the mix and understand constituents and listen to my colleagues. I don’t take too many radical positions and not be overly enthusiastic. I want to push the needle in the right direction. And one hopes that I am doing some good and will get re-elected. I have some time to affect policy that affects architecture in our city. In championing the General Plan, Joe Webb (chair of Blueprint Houston) and Martha Murphree (executive director of Blueprint Houston) have been longstanding advocates. The emphasis is more on the efficiency and coordination of municipal resources. There is an awkward piece of law written into the charter about the city of Houston adopting a comprehensive plan. What we are currently considering is the removal of language that says Houston will adopt zoning. The General Plan—all with an asterisk, is what we can do according to those who agree to do it—will adopt a framework for guiding Houston in its principles for growth. It’s important to have such a plan based on economic viability. It’s an essential component of our planning and budgeting. Houston needs to coordinate efforts better and communicate with the various stakeholding groups. It is an inclusive process from the city’s side in getting everyone to the table—the steering committee, stakeholder group, support staff, technical advisory committee. So what is this supposed to do and what does it look like? It’s encouraging leadership, it’s transforming neighborhoods, and it’s keeping it exactly the way it is. That is the consensus. The role of the General Plan is to not mess with something that is stable and good. It’s about the subtlety and diverse nature of Houston’s wonderful neighborhoods. It’s not shoving anything down anyone’s throat. What it becomes remains to be seen. It’s not a mystery that the funding for the deal and presentations from (Planning and Development Director) Patrick Walsh and stakeholders syncs up with a mayoral election. Mayor Annise Parker only has seven more months in office. It’s not lost on us. We need to make a political commitment. We are living with a strong mayor form of government. What we like as a professional community is some vision and predictability in the market. We know there are some causes of turbulence and market fluctuations. We need to do something to stabilize the economy when it comes to the built environment. It’s a good outcome of the General Plan. People rely on city services—processing, permitting, license renewals—those things should not be complicated or rocket science. We still have a long way on that. We are trying to make the city a better place—administratively, practically, and in the economic environment. As a former planning commissioner and president of the Neartown (Montrose) Association, I understand you have a deep-seated understanding of the development and community issues. As Houston continues to grow in the next 20 years, what changes and retooling do you see happening? I live in Montrose and our northern boundary is beautiful with the Buffalo Bayou trail. The Kinder family has recently made a $50 million benevolent gift for the Bayou Greenways Initiative with linear miles of hike and bike trails. Houston is earning a reputation for an incredible commitment to greenways, and developing an interconnectedness and coordinated efforts of the city and county working together. Years ago, there was legislation passed in Austin with language passed about the utility corridors for power lines and easements that was highly contentious. The utility companies refused to allow hike and bike regional corridors. If someone falls or climbs a pole and fries themselves, they could sue the state or utility company. Then two years ago, legislation to provide indemnity was passed in Austin. It freed the urban grid so bayous and the framework are being built out now for the public infrastructure. In the fiscal budget for last year, I allocated $10-to-$20 thousand to Patrick Walsh in support of the master bike plan. My little brother is the forester in the Commonwealth of Massachusetts, which has a trail program. I am committed to parks and trails. We have to be working on green space and urban gardens. How did you come to the decision to seek office? Most architects take the path of licensure and then private practice, but you have walked a different path. I had served as president of the Neartown (Montrose) Association and was emerging as a leader in the community where I live. I spent five to six years as president of the super neighborhood and was nominated by Sheriff Adrian Garcia to be on the planning commission. In 2003, I had been nominated to the Municipal Arts Commission (MAC) and worked with Rick Lowe. My job on MAC was to sunset it. On the planning commission with jurisdictional and extraterritorial Houston and Harris County, you have direct oversight over real estate and development across our region. With success on the commission there, I got nominated to the Super Neighborhood Alliance and before long I was president of that organization until 2013. In 2011, I felt the urge to run for City Council, at-large position #2. A huge flock of humanity wanted to get in. There were 10 candidates. I did not win. But I had success in getting my name out there. These things take time. So then I stepped down from the planning commission, then two years later I prevailed, and not by many votes. But for an outsider to take an incumbent, it was a feat. What architecture projects are you currently working on? I take on smaller projects. I have to be careful about how I choose clients. My main project is the city and I do practice some architecture. I have two primary clients. We are doing some residential and commercial planning in Houston’s 3rd Ward, the CDC MacGregor Area. The project is on land they have amassed in the Riverside area. Another project is a renovation of a downtown warehouse at Hutchins and Bell. We are renovating two 5,000-square-foot buildings for Lighting & Electrical Sales company. Any other thoughts to add about the future? This terrain I got to inherit, Houston, is an incredible and thriving city with great people and wonderful neighborhoods. We are sprucing ourselves up. There is real activity dedicated to looking good when the Super Bowl comes in 2017 and we have a worldwide stage. The front door of Hobby Airport to 45 is indisputably ugly. We have work to do on Broadway. One long-range vision is a new botanical garden just past 45. I am pleased to say I am not seeking the mayor’s seat in the future. I love all my jobs. I love being a daddy. My 15-year-old is the center of my life. I love being an architect. I love what God has given me to work with now. If I think back to 2010 and where I was—serving and working in a tough recession time—I would be a fool to predict anything from now. Maximilian Roch: Schloss und die Lange Brucke mit dem Reiterstandbild des Grossen Kurfursten, Berlin, 1842. “Berlin ist eine Reise wert” (Berlin is always worth a trip) the catchy title of a tourist guide from the 1950s, has been quoted over and over again, suggesting to many expats to “always still have a suitcase in Berlin,” like Marlene Dietrich always claimed. And yes, Berlin is (still) always worth a trip for the culturally interested architect and art connoisseur. We all are quite familiar with the numerous contemporary architectural masterpieces that have been accumulating in Berlin West and now East since the Second World War. But baroque Berlin? Who knew?! It is a pleasure to hold the little book Schlüter in Berlin, Stadtführer, A City Guide, in one’s hand. It was published recently in connection with an exhibition in spring 2014 at the Bode Museum with the title Schlossbaumeister Andreas Schlüter, und das barocke Berlin (royal building master Andreas Schlüter and the baroque Berlin). It might seem at first surprising to plan to view baroque sculpture and architecture in Berlin, as one might assume that such works of art were eliminated, looted, or blown up into bits and pieces with the help of Berlin’s violent past. It has always been a bit unnerving to me to pursue the affect of baroque works of art and architecture and admire its beauty and truly gripping effect with the accompanying bad political consciousness, as these artists usually were employed by re-strengthened conservative counter reformations and new forms of absolutist governments. How can we love the aesthetic effect so much but abhor its political aims? Theodor Lubieniecki: Kopf eines sternbenden Kriegers, Berlin, 1696. The different writers that were engaged to shed some light onto the numerous works by Andreas Schlüter are very good at pointing out that the work we see has been produced to reflect the aspirations of the highly ambitious Frederick I, who desired to put the city of Berlin back on the map after it was decimated to 6,000 inhabitants by the Thirty Year’s War. He wanted to measure himself and his aspirations for power with Paris (450,000 inhabitants at that time) and Rome, an even more far-fetched aim. To do so, he hired Schlüter in 1694 in order to have at his court an architect/sculptor who could help him design the buildings and sculptures that would reflect his grand aspirations. Indeed, all these aspirations did end in the crowning of Frederick as the King of Prussia in 1701. Schlüter seemed as good a choice as one could get at the time. He was well known, was well travelled, and had just worked for the king of Poland. Obviously he knew Bernini and his cohorts and his aspiration was to become a recognizable force north of the Alps. What is surprising today is how much of his work is still around and how much survived the Second World War. Unfortunately, Berlin City Palace, after having survived the war quite well, was then blown up for ideological reasons by the East Berlin Socialist government in the 50s. It is too bad though that the book seems to suggest that a simulated re-erection of the lost Palace as a new business center is an acceptable solution today. The book shows a lot more sculptures than buildings, not that surprising, as especially in that period, architecture as a profession was normally folded into the activities of a sculptor. 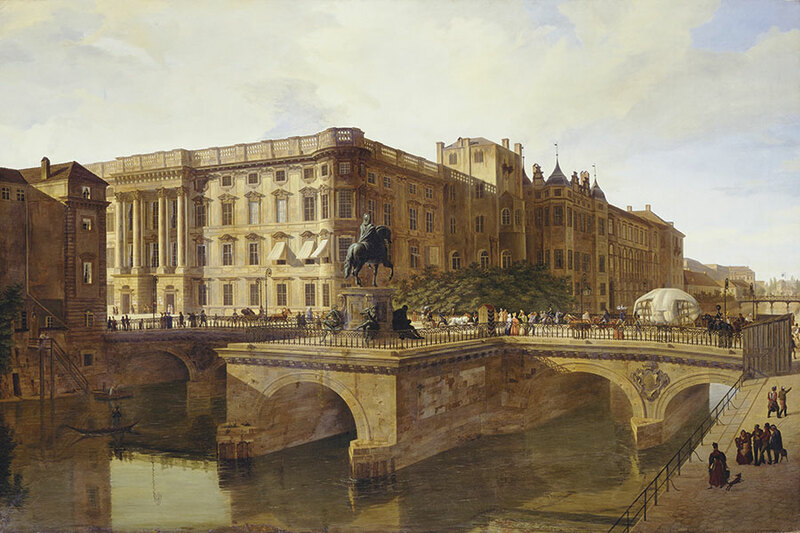 One example is the re-envisioning of the Berlin City Palace’s facade, which by 1701 was finished to serve as the new background of the crowning of Frederick. One can see parallels to Rome in this story. Bernini was fired from a job because of weak foundations. The same happened to Schlüter, who lost his royal building director’s job after a few years when the new tower he had designed started to sink after arriving at the 60-meter mark. It was supposed to be 100 meters tall. It was not the first time the sculptor/architect was entrusted with large-scale building endeavors that resulted in rather basic technical failures. 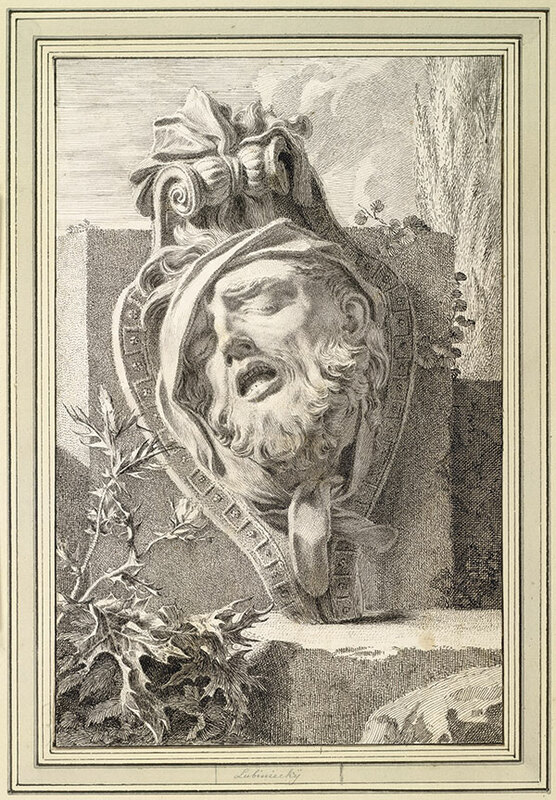 The guide shows that Schlüter was majorly involved in the decoration of the Arsenal at the same time he was involved with the Palace and later on was able to design the sarcophagi for Frederick’s early deceased wife, Sophie Charlotte, and the king himself, who died in 1713. The Chancellery in St. Mary, the Portal for Daniel Männlich the Elder and his wife’s tomb, the equestrian Statue to the Great Elector, and other wonderful spaces, decorations, and artifacts are well documented, their historical background well described and well located (as most of them were moved around) in this book. It is a pleasure to be able to use this small guide to go onto a hunt for baroque greatness in Prussian Berlin. What a surprise! 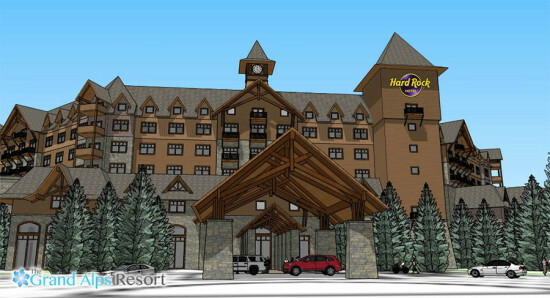 Grand Prairie, Texas, has been spared what could have been the nation’s first indoor ski resort and Hard Rock Hotel. The project’s developer, The Grand Alps Group, pulled the $215 million proposal after a meeting with Grand Prairie’s mayor and city manager. They were not happy about losing the big fish. “We were a little surprised,” City Manager Tom Hart told the Dallas Morning News. “We thought we had a pretty good meeting.” In a press release, Sherman Thurston, Grand Alps’ CEO, cited a disagreement about “terms and conditions and costs” as his reason for pulling out of the deal. Apparently the $30 million in tax exemptions, offer to purchase half the land, and return of 75 percent of the hotel-motel taxes that Grand Prairie promised Thurston wasn’t enough to convince the developer, who claims to already have financing in place to build the project, including $100 million from foreign investors, mostly Chinese. Grand Alps is currently looking for other possible sites in the Dallas–Fort Worth area. February's over and that means Spring is a little, tiny bit closer. But while there's still snow on the ground here in New York, let's take a look back at the top stories from last month as voted by you, our readers. We saw a mix of topics hit the top posts, including high-tech transport, jewelry design, Frank Gehry's funky architecture, and a heartwarming film about growing up with architects. Take a look at the top links below. Animated film shows how growing up with modernist architect parents comes with its own challenges A short film called Me and My Moulton by director Torill Kove takes a humorous look at growing up with parents who are “modernist architects”—and it’s been nominated for an Academy Award under “Best Animated Short Film.” Told from the perspective of of a seven-year-old middle child, the challenges of growing up with architect parents include three-legged dinner table chairs and a house that your friends think is a bit odd. Read more. New teams taking on Elon Musk’s Hyperloop high-speed transportation concept While California’s High Speed Rail system broke ground last month in California, Elon Musk’s dream of a Hyperloop, a rocket-propelled system that would shuttle passengers (and/or freight) across the state (and perhaps the country) in minutes, not hours, is making surprising progress, with new teams, and visions emerging. Read more. 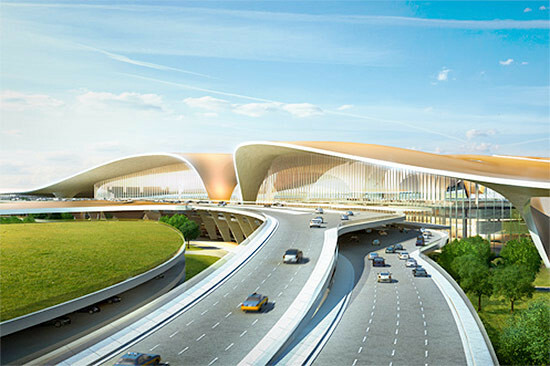 Zaha Hadid unveils plans to build the largest airport terminal on the planet—in China Fresh off settling a legal dispute with New York Review of Books critic Martin Filler, Zaha Hadid has unveiled plans for her latest project. And even for the Queen of Swoop, this one is big. Very Big. Record-breaking big. Read more. Put a Ring on It: Architectural Jewelry Features Functional Measuring Tools Rather than wear your heart on your sleeve, why not sport your passion on your finger? Peruvian architect Diego Delgado-Elias has created a collection of rings ornamented with miniature mainstays of the architect’s toolkit. Read more. Everyone thinks Frank Gehry’s new building in Australia looks like a paper bag The most famous architect in the world agrees that his latest building kind of looks like a crumpled brown paper bag. But that’s not necessarily a bad thing, said Frank Gehry, the creator of the very wavy, very paper bag-y Dr. Chau Chak Wing Building at the University of Technology, Sydney. “It is a container, maybe it is a brown paper bag,” said the starchitect at the building’s recent opening. “But it is flexible on the inside; there is a lot of room for change and movement which I think in the world today is essential.” Read more.